Following Friday’s resounding victory over Exeter University, the next visitors up to Weetwood will be Oxford MCCU. The Dark Blues will be facing us in the BUCS competition on Monday 20th April (12.30 pm start) before taking us on in our first 2-day game of the season on Tuesday and Wednesday (11.00 am start each day). Graham Charlesworth’s squad lost two and drew one of their county games earlier this month. After a heavy defeat against Worcestershire they then lost again against Middlesex – although did have Nick Gubbins and his county teammates in trouble at various points before eventually going down by 7 wickets. Their final 3-day game saw them draw against Surrey, with Kevin Pietersen (170) and Gary Wilson (119*) smashing centuries in the first innings. 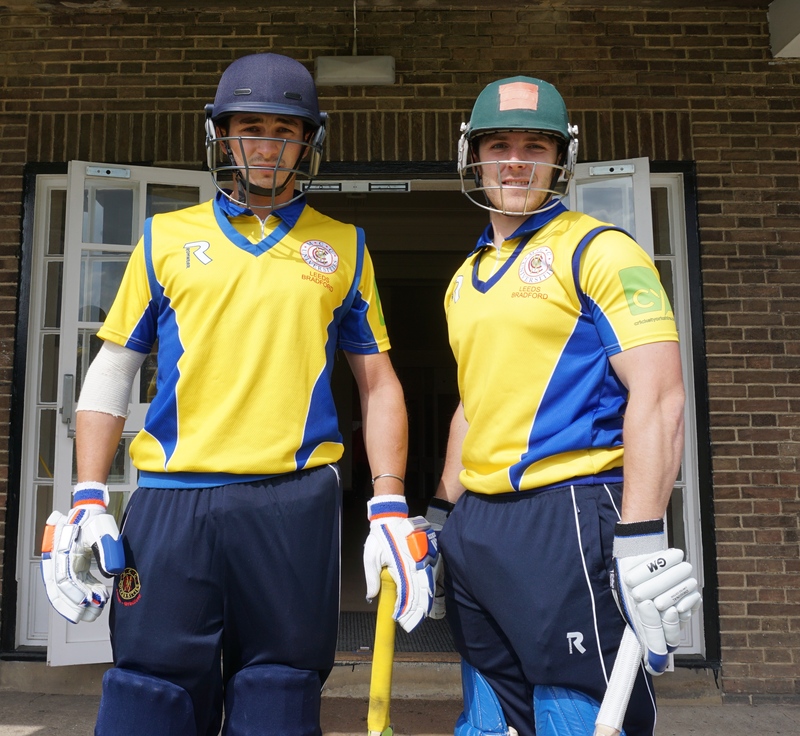 Oxford had their own centurion though when Steve Leach, brother of former Yellow Joe, compiled an impressive 110 not out in their second innings. Andrew Lawson has announced an unchanged 12 for Monday’s BUCS game: Davis (capt), Bullen, Wakefield, Root, Weston, Scott, Rouse, Watkinson, Lilley, Ogden, Myers, Ellis-Grewal. There’s a decent forecast for all 3 days so if you can, please come along & support the boys! The Yellows began their BUCS campaign in sensational style with an emphatic 10 wicket win over Exeter University. The visitors batted first and were soon in trouble, Alex Lilley sliding one across Abell and inducing the edge to wicket-keeper Steve Bullen in the first over. Lilley, celebrating his 23rd birthday, grabbed two more victims within the first nine overs and continued to bowl his full allocation straight through to finish with figures of 10-2-20-3. On a Weetwood wicket showing more bounce and pace than in the past, thanks to the work of new groundsman Richie Robinson, Harry Rouse and Liam Watkinson also picked up wickets at regular intervals, Watkinson’s first delivery giving Bullen the second of his four catches behind the stumps. Rouse ended up with 2 for 24 and Watkinson 4 for 28, Joe Ellis-Grewal (1 for 9) being the other wicket-taker as Exeter were all out for 84 in the 32nd over. Only Craze with 29* offered any resistance, the second highest scorer being Extras with 12. Steve Bullen & Chris Wakefield tucked into the Exeter attack from the start. Bullen was particularly aggressive and brought up his 50 from just 37 balls before hitting the winning runs with a maximum over long on after only 10.4 overs to end up on 57*, Wakefield looking comparatively subdued on 20*. Next up: Oxford MCCU in the BUCS competition next Monday (12.30 pm start). After three 3-day games against county opposition Leeds Bradford get down to the ‘bread & butter’ part of the season tomorrow (Friday 17th) with their first game against university opposition. Exeter University will be visiting Weetwood as the Yellows play their opening BUCS game in the Premier A Division. These are 50 over games played with a pink ball and the usual one-day fielding restrictions. The division contains the 6 MCCU centres together with Exeter & Solent Universities – the latter being coached by Ex-Leeds Bradford skipper, Richard Browning. Exeter showed their strength by reaching the final last year, losing to Loughborough. They played their first game of the campaign today (Thursday 16th) but lost to Durham MCCU by 8 wickets. The game starts at 11.00 am. All supporters welcome and we’ll be tweeting regular updates on @leedsmccu. A season that begins with a hat-trick of draws might not sound inspirational at first glance but Leeds Bradford MCCU’s performances against each of the three counties has been reason to be proud. Most recently against Lancashire, Bill Root’s 46 runs & 4-49 and Steve Bullen’s 97 over in Manchester spring to mind; meanwhile, defying Yorkshire at full tilt required patience and determination. Alex Lilley’s 4-65 in the first innings and Joe Ellis-Gewal’s defiant 42 batting at ten are just two of the highlights from Headingley. The nominal target of 421 was put into perspective as Leeds Bradford ground their way to 48-4 off 33 overs. Given how Yorkshire subsequently blew away Worcestershire to the tune of ten wickets in the County Championship, that back-to-the-wall defensive effort was a credit to the lads. Sussex at Hove probably already feels like a lifetime ago but the second day washout was a shame. Nonetheless, batting #digin display from Liam Watkinson and Christian Davis was a decent early-season display of resistance. Good luck to the squad as they take on other university squads across formats in the coming months! Leeds Bradford MCCU begin an exciting summer of cricket with a fixture down at Hove against Sussex County Cricket Club. Gubbins, Thompson, Root, Weston, Davis (capt), Watkinson, Wakefield (wk), Scott, Lilley, Rouse, Ellis-Grewal, Pratt. Nick Gubbins has been released for this game by Middlesex and if he scores 65 in this game, he will become Leeds Bradford’s highest ever run-scorer (all competitions). The current highest is Gharib Nawaz with 1,781 runs. First class debuts will be given to Weston, Root, Watkinson, Wakefield, Scott, Pratt, Ellis-Grewal. For pre-season, Sussex have been out in the UAE on tour and had a two-day draw against a Combined XI of Sussex and Yorkshire players and a 23-run defeat to Durham in a 50-over game. They were also narrowly defeated at Sheikh Zayed Stadium in Abu Dhabi by MCC Young Cricketers. Pace bowlers Tymal Mills and Ajmal Shahzad, signed from Essex and Nottinghamshire respectively over the winter, are due to make their first-class debuts for Sussex; but Lewis Hatchett misses this game through injury, James Anyon is out of the first weeks of the season as he recovers from a knee problem, and Matt Prior is not yet fit from his achilles injury. Good luck to all of the Leeds Bradford MCCU squad for the Sussex match and an action-packed season ahead. Leeds Bradford MCCUNick GubbinsSussex County Cricket Club. Come along on 7 April to Headingley for the Leeds Bradford MCCU Open Day! 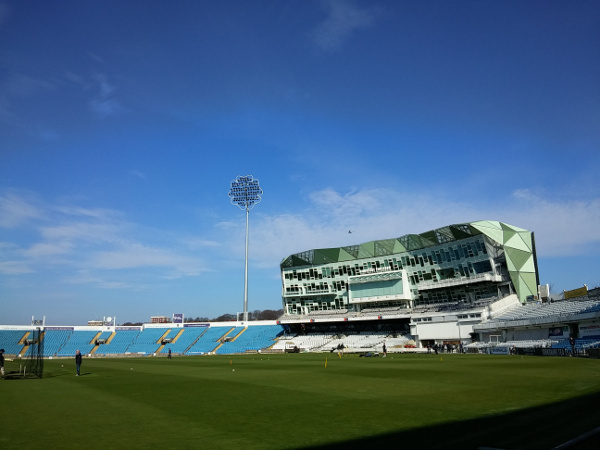 From 9.45am to 2pm, there are a programme of events designed to introduce prospective students to the Leeds Bradford MCCU programme whilst watching them play the first day of their first-class fixture against Yorkshire County Cricket Club. To attend or find out more, email David Bond: d.a.bond@leeds.ac.uk. Probably the first time we’ve played cricket on English soil while still in Greenwich Meantime; definitely the first time we’ve warmed up for a days play in the middle of a solar eclipse! Leicestershire CCC kindly agreed to host us for two days of cricket to enable both teams to get out on grass for the first time since last September. Instead of playing a typical 2-day game it was agreed to play two 45-overs per side games in a bid to give more guys a chance for meaningful practice. The games weren’t played under one-day rules though – time in the middle and overs in the legs being the key aims. With seven of our squad over in Abu Dhabi with the Combined MCC Universities team and two more over there with their counties, 8 of the 12 players who headed down to Grace Road for our pre-season friendlies against Leicestershire CCC were newcomers to the squad. Welcome Steve Bullen, Billy Root, Logan Weston, Ryan McKendry, Archie Ogden, Chris Harwood, Kieran Grundy & Doug Pratt! Day one saw the Yellows bat first on a wicket and outfield that were in particularly good nick for the time of year. Henry Thompson (41) and Bullen (16) began the campaign steadily with a partnership of 46 in 12 overs. Root played sweetly for his 27 before falling leg before to an attempted reverse sweep, McKendry fell without scoring and then Weston (59*) and Harry Rouse (22*) built a partnership of 53 in 14.3 overs before the innings closed on 170 for 4. Again, time at the crease was key as opposed to AB de Villiers style strike rates. Nine bowlers then turned their arms as the Foxes closed on 239 for 4, former Worcester batsman Neil Pinner looking particularly impressive with 89* and Tom Wells chipping in with 57. There were wickets apiece for Pratt, Grundy, Rouse and Harwood – Pratt bowling particularly well with figures of 7-1-19-1. Day two saw the professionals have first knock. The Yellows on the whole bowled much tighter lines. At lunch Leics were 129/4 from 29 overs, their innings eventually closing on 211 for 7 with half-centuries from Dan Redfern and Pinner. Wickets were shared with Ben Eckton hitting a nice rhythm. Despite going for 21 in his first over, he ended up with 1 for 36 from 6 – a great comeback. Archie Ogden also recovered from a loose first couple of overs to finish with 2 for 30 from 6. Steve Bullen laid into the experienced Charlie Shreck from the start of the Leeds Bradford innings, smashing him for 26 from his first two overs (including a maximum over extra cover). Billy Root then took a liking to the 6ft 7” seamer, driving him for two sublime straight boundaries. Root went on to score a fluent 60 from 56 balls (13x4s) before being caught behind. Weston added 32 to his unbeaten half-century the day before but when Rouse (9) became the sixth victim in the 32nd over, the Yellows were still 52 behind the Foxes total. Stand-in captain Alex Lilley helped Ogden add 31 before falling to a return catch off Jamie Sykes, but Chris Harwood (18 from 21) and Ogden (32 from 42) helped us overhaul the Leics total with 2 balls to spare. A superb workout for both teams and played in the right spirit. There have been much publicized back-room changes at Grace Road over the winter and the atmosphere there seemed so much better than when we beat them in a first class game two years ago. Thanks to all of them for hosting us, particularly Head Groundsman Andy Ward and his team. All at Leeds Bradford wish them well for the season.